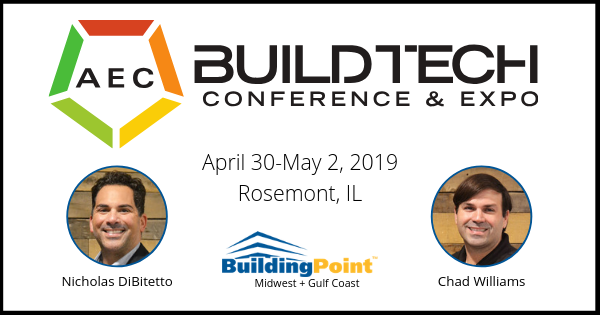 Representatives of BuildingPoint Midwest & Gulf Coast will deliver a featured presentation at the upcoming First Annual AEC BuildTech Conference & Expo in Chicago. BuildingPoint Midwest and Gulf Coast’s Nicholas DiBitetto, General Manager and Chad Williams, Field Support Engineer, will discuss Getting the Most Out of Mixed Reality: Using MR for Multiple Workflows from noon to 12:40 p.m. Thursday, May 2 in the Learning Theater. This presentation will include a demo of the leader in mixed reality construction technology Trimble Connect HoloLens. Our representatives will also be on hand to demonstrate a full range of Trimble Design, Build, Operate solutions at our hands-on booth located in the expo hall. For more information on AEC BuildTech or to register, visit the event’s website.